LIONESS has just dropped her ‘DBT’ Remix and it is one of the most socially significant and impactful records, arguably since Bashy released ‘Black Boys’. Receiving a wave of support and praise from her peers like JME, P Money, Clara Amfo and Funk Butcher, LIONESS takes a dignified, powerful and stealthy approach as she tackles colourism, marginalisation and sexism head on. The stereotypes and insults that come with having a dark skin tone AND being a woman are not only raised but catapulted forward in this passionate, energetic and very real account, as they were in her original DBT freestyle. 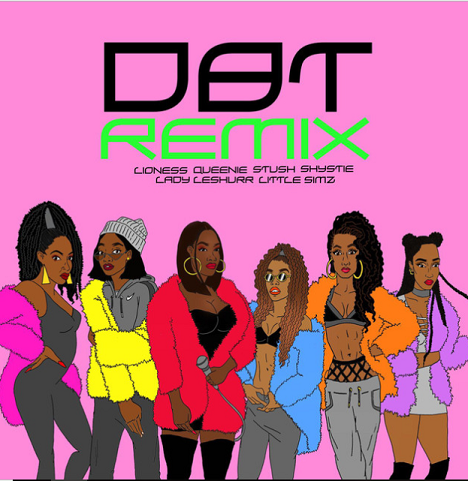 Alongside an incredible line up of respected black women and exceptionally talented emcees; Queenie, Stush, Shystie, Lady Leshurr & Little Simz, the remix, produced by grime lord Prince Rapid is a heavy hitting, energy laden vibe by all accounts but lyrically it is a power anthem that should not only be heard, but listened to, and listened to closely. But are we hearing it? The response via social media and urban music platforms like MOBO, The Hype Magazine and Nation of Billions has seen an outpouring of support, praise and community for these incredible females that have gone against the grain, spoken out and empowered themselves, and those listening, with their strength and honesty. A small pocket of the grime scene is hearing it and standing proud of what is being achieved here, yet the wider media seems like it is not yet listening, proving one of the most important points that are being raised in the record.